Now Open: Bernard Dog Run - Wylie Holdings L.P.
We’re excited to see the Bernard Dog Run finally open in Lawrenceville! 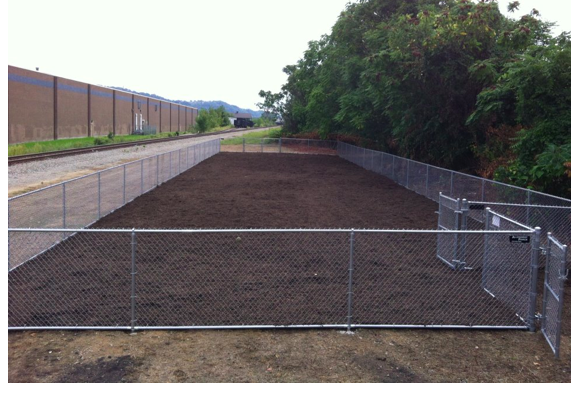 What used to be vacant space under the 40th Street Bridge is now a fenced in dog run with separate areas for small and large dogs. This is something that Lawrenceville has needed for a long time, and we know that many residents are excited for a new space to take their dogs. Back in March we were one of the lead sponsors of a Spaghetti Dinner that raised money for the completion of the park, which is named in honor of the late Jay Bernard — a Lawrenceville resident, entrepreneur and abandoned dog advocate.This new attraction is a great compliment to the many dog friendly and pet centered businesses in our neighborhood. A few of them are located in Wylie Holdings spaces, such as The Big Easy Animal Hospital and Urban Dog Day Care & Day Spa. Both are just a short walk from the new dog run!